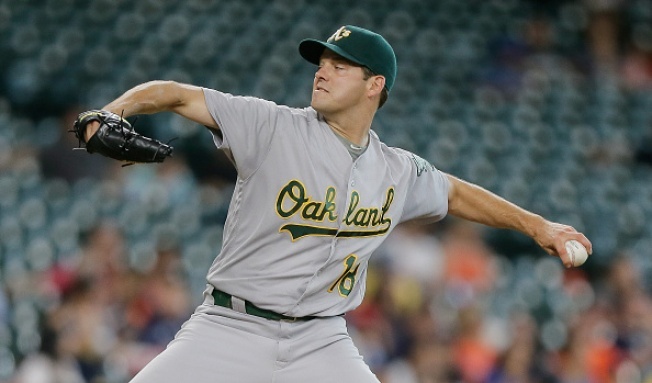 HOUSTON — Rich Hill has made himself at home with the A’s this season, but it’s on the road where the lefty has really shined. He won for the seventh time in seven starts Thursday, dominating the Houston Astros over six innings in Oakland’s 3-1 victory at Minute Maid Park. Hill, a strong trade candidate and a hot name in the rumor mill these days, struck out 10 and allowed just three hits over six innings to ring up his ninth victory and his first in two starts since returning from the disabled list. Hill entered the game as just the fourth pitcher in franchise history to win all of his first six road starts on the season. He’ll be in even more select company now after improving to 7-0 with a 1.41 ERA away from Oakland. He gave up a triple to George Springer on his first batter faced, and Springer came around to score on Marwin Gonzalez’s grounder. After that, Houston advanced just one runner as far as second base with Hill (9-3) on the mound. The A’s, struggling offensively of late, won the opener of this four-game series despite mustering just four hits. They put up two runs in the second and made it stand. Hill has won six of his last seven decisions, a six-game winning streak that ties his career best. Starting pitching report: The big curve that’s perplexed hitters all season was working for Hill. But his fastball, the underrated part of his arsenal, also was extremely effective. He threw it by several Astros hitters, though it was consistently clocking in the 89-91 mile-per-hour range. Minute Maid Park may be known as a bandbox, but pitching in the retractable-roof venue agrees with Hill. In six career outings here (three starts), he is 3-0 with a 1.19 ERA ( 3 ER in 22 2/3 innings. Notably, Houston’s 3-4-5 combo of Jose Altuve, Carlos Correa and Carlos Gomez were 0-for-8 with four strikeouts and a walk against him. Bullpen report: John Axford, Ryan Dull and Ryan Madson set down nine consecutive hitters in icing the win for Hill. At the plate: After the Astros took a 1-0 lead in the first, the A’s answered back in the second. Danny Valencia and Khris Davis led off with singles and Stephen Vogt walked to load the bases. Marcus Semien’s double-play grounder tied the game, then Yonder Alonso drove a two-out double to the opposite field to score Davis and put the A’s up 2-1. But the A’s would go hitless the rest of the way off Fister until he left after the eighth inning. The Merced native has faced Oakland three times this season and surrendered just 14 hits and three runs in 20 2/3 innings. The A’s had their issues throughout the game with home plate umpire D.J. Reyburn. Coco Crisp was ejected after striking out in the fifth and tossing his bat in Reyburn’s direction. That came two batters after Yonder Alonso argued demonstratively following a called third strike. In the field: The A’s established a new franchise record with their 13th consecutive game without an error.